The Channel9 Podcast Player sample application declares a list of default tasks that appear in the Jump List. These static, site-specific items appear in a Jump List category called Tasks. A Jump List can contain commonly used destinations and tasks. Some items apply to the whole site, and some apply only to specific users. This task explains how to add site-specific tasks to the default Jump List of a Pinned site. Jump List items act as entry points into the website even when the browser is not running. If you want to add items based on recent activity or user preferences, see Adding items to a Jump List Dynamically. While a destination is a thing, a task is an action, and in this case it is a site-specific action. Put another way, a destination is a noun and a task is a verb. In the context of a Pinned site, a task can be any common navigation or site functionality. Some tasks are static, meaning that they are set when the site is pinned. Others, like notifications and user-specific tasks, are dynamic and change over time. Static tasks are defined using meta tags. These properties apply to any one using the site when it is pinned and appear in the category named Tasks. This category can contain up to five items. The items in this list tend to remain the same regardless of the state or status of the application. This topic explains how to add static tasks. A Pinned site can only have one static list and one dynamic list at a time. 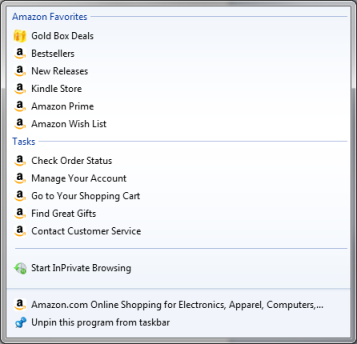 For example, the following Jump List from Amazon.com contains both kinds of tasks. name A string. The task name that appears in the Jump List. action-uri A fully qualified or relative URI. The address that is launched when the item is clicked. icon-uri A fully qualified or relative URI. 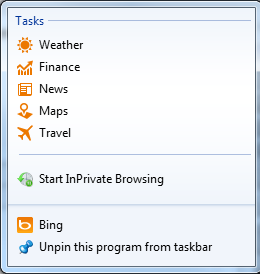 The icon resource that appears next to the task in the Jump List. In general, relative paths are easier to maintain than fully qualified URIs. You can add any URL parameters that you require, even those that help you track IE9 usage (see the URL parameter named src in the preceding example). The action-uri part does not allow you to use a semicolon. The tasks in the Jump List appear in the same order as they are defined in the HTML source. 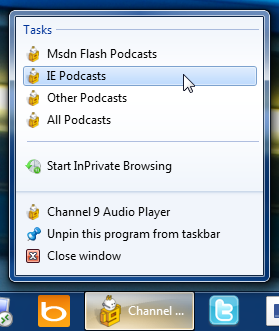 Here's the source for the task list in the Channel9 Podcast Player sample application. Each task specifies a URL parameter that filters the podcast playlist by topic. This task completes the site metadata that you started in the Declaring Pinned Site Metadata task. You have defined the basic elements of a Pinned site, but your users still need a way to differentiate your site from the other applications on the taskbar. The Customizing the Site Icon task explains how to create a high-resolution icon for your site. In addition, the Prompting Users to Pin your Site task shows you how to promote your Pinned site features. The msapplication-task metadata, together with the elements described in Declaring Pinned Site Metadata, creates the default Jump List of your Pinned site. 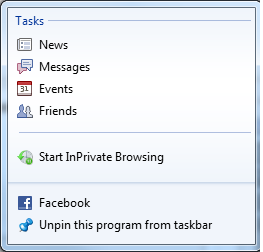 The examples in this section show how some popular websites have used a static Jump List to enhance their user experience in Windows Internet Explorer 9.